Interest in whether Master’s degrees may associated with improved teacher effectiveness is widespread. According to the National Center for Education Statistics (NCES, 2010), the number of teachers in the United States who hold an advanced degree has almost doubled over the past 50 years, with half of all teachers in the U.S. currently holding a Master’s degree. Across the nation, school districts offer monetary rewards to those teachers who hold advanced degrees, with the increase in salary averaging 11% (NCTQ, 2010). Additionally, districts often subsidize the cost of tuition, making it more affordable for teachers to earn these degrees. Between salary increases and tuition costs, districts are making substantial investments in a more educated workforce. 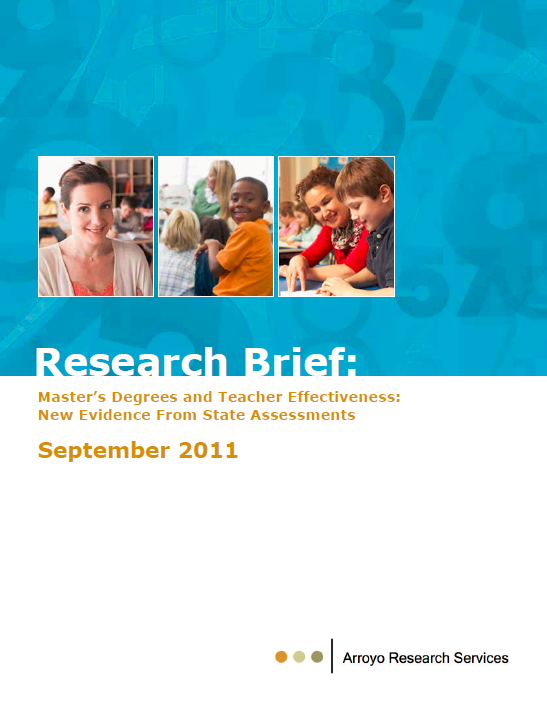 However, when taken together, the body of research examining the impact of holding a master’s degree on a teacher’s effectiveness in the classroom suggests that advanced degrees are not associated with improved student outcomes (Clotfelter, Ladd, & Vigdor, 2007; Goldhaber & Brewer, 1997). A few studies have even found slightly negative effects on student achievement by teachers holding a Master’s, while several others report small but significant positive effects. The majority of published work finds no effect of teachers’ advanced degrees on students’ academic outcomes. 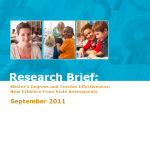 In a research brief summarizing the most recent findings in a three year study examining the effects of master’s degrees on teacher effectiveness, however, Arroyo Research Services found that elementary students whose teachers held a master’s degree performed statistically significantly better in both reading and language arts than students whose teachers did not hold a master’s degree.